US Steel on Tuesday raised its earnings guidance for 2018. The expected boost from Trump’s tariffs wasn’t as much as investors may have been expecting, one analyst said. 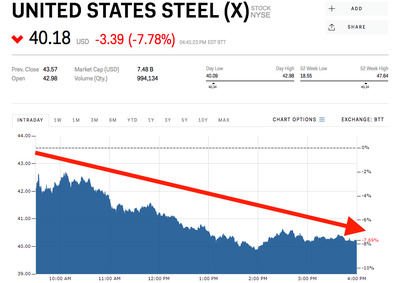 Shares of US Steel declined as much as 8.1% Tuesday after the company raised its full-year earnings guidance, but not as much as investors were expecting following President Trump’s new tariffs on imported steel and aluminium. For full-year 2018, US Steel expects its earnings before taxes depreciation and amortization, or EBITDA, to be “approximately $US1.7 billion,” it said Monday. That’s up just $US200 million from its prior guidance, which was released before the company said it would restart its Granite City plant. The company says restarting operations at its Granite City plant can produce about 100,000 tons per month once completely online in the second half of the year. But, one Wall Street analyst, speaking to Business Insider on background, says the numbers don’t add up. At today’s prices for hot rolled steel coils, the EBITDA increase from an extra 600,000 tons of steel should be more than what the company has guided this week. In February, Cowen analyst Novid Rassouli told Business Insider that the new taxes could make US Steel’s margins “laughably high” by doubling the company’s EBITDA. Shares of US Steel are up 7.47% this year. The tariffs are set to take effect on March 23.